To me one of the best things about fall is the baking. Filling our home with the familiar warmth and comforting smells that only this time of year can bring makes me think of spending time in the kitchen with my grandmothers and thanksgivings spent with family. I made this bread a few weeks ago (my first fall recipe of the year) to bring to my brother, parents and grandmothers and I know it’s going to get made many more times before autumn is over! To me, there is nothing better on a fall morning than curling up with a cup of coffee and a moist, dense and spiced piece of pumpkin bread. This one’s made even better with the addition of a delicious streusel that also gives a little boost of protein with the pumpkin seeds and pecans. The other great thing about this recipe is it makes A LOT so you could share the wealth with friends and family or freeze some to enjoy it even longer! I made two loaves, a giant 9″ x 5″ and one 8″ x 4″ but you could also do a bunch of mini loaves or whatever you like! 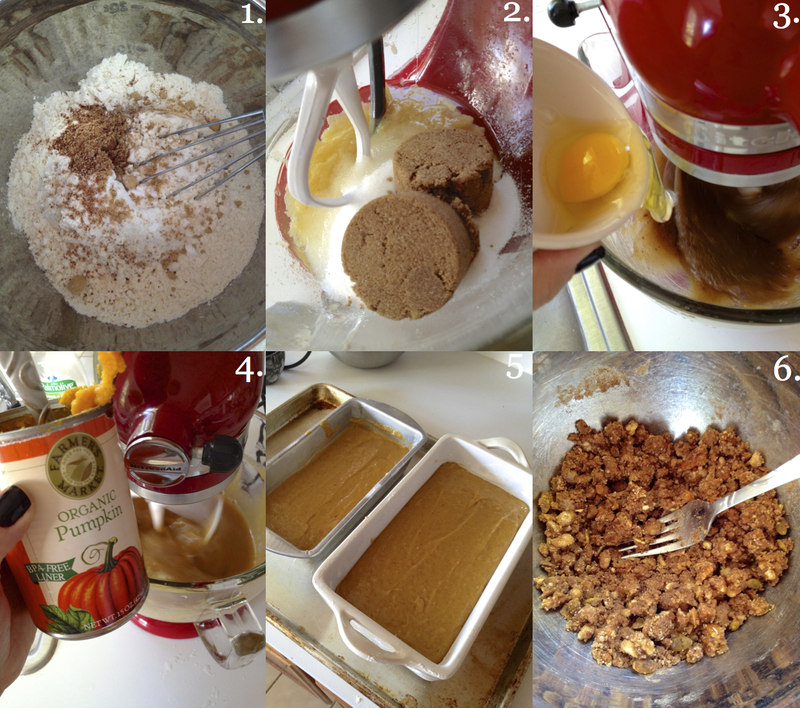 I want to start linking to other great recipes so share your favorite fall baking recipes in the comments and I will add them to this post! Recipe adapted from Bakingdom, found HERE. Preheat your oven to 350F and butter and flour your loaf pans (again, I used one 9″ x 5″ and one 8″ x 4″ pan, you could use three 7″ x 3″ pans or six mini loaf pans) and place the pans on a baking sheet. In a medium bowl, whisk together 3 1/2 cups all-purpose flour, 2 tsp baking soda, 1 tsp salt, 1 tsp freshly grated nutmeg, 1 tbsp cinnamon, 1/2 tsp ground ginger and 1/2 tsp ground cloves (1). In a stand mixer, cream together 1/2 safflower oil and 1/2 cup apple sauce on low speed then add in 1 1/4 cup granulated white sugar and 2/3 cup packed dark brown sugar (2) and beat on medium until incorporated. Add in 4 large eggs, one at a time (3) beating well after each one and then add in one 15 oz. can of pumpkin puree and 2/3 cup room temperature water (4). Add in the dry ingredients, mixing until just incorporated. Pour the batter into your loaf pans, filling slightly more than halfway (these rise quite a bit) and level off with an offset spatula (5). Make the streusel by combining 1/2 cup packed dark brown sugar, 1/2 cup flour, 1/2 cup chopped pecans, 1 tbsp cinnamon, 1/4 cup melted butter and 1/3 cup chopped pumpkin seeds in a small bowl and crumbling with a fork (6). Divide evenly among the top of the batter in the loaf pans. Bake for 25 minutes, then rotate the baking sheet and bake for about 25-30 minutes more. My smaller loaf pan took 27 minutes more and the giant one took almost 40 minutes more because it was so large. Just shake the baking sheet and make sure it doesn’t jiggle and then check with a toothpick to make sure it comes out clean! If you like this post check out my Pumpkin Spice Latte Cupcakes HERE, my chai pistachio morning cake HERE or my Pumpkin Carrot Muffins HERE! Preheat your oven to 350F and butter and flour your loaf pans (I used one 9″ x 5″ and one 8″ x 4″ pan, could also use six mini loaf pans) and place the pans on a baking sheet. In a medium bowl, whisk together flour, baking powder, salt, nutmeg, cinnamon, ginger and cloves. In a stand mixer, cream together the oil and apple sauce on low speed then add in both sugars and beat on medium until incorporated. Add in the eggs, one at a time, beating well after each one and then add in pumpkin and water. Add in the dry ingredients, mixing until just incorporated. Pour the batter into your loaf pans, filling slightly more than halfway (these rise quite a bit) and level off with an offset spatula. Make the streusel by combining all ingredients in a small bowl and crumbling with a fork. Divide evenly among the top of the batter in the loaf pans. Bake for 25 minutes, then rotate the baking sheet and bake for about 25-30 minutes more. My smaller loaf pan took 27 minutes more and the giant one took almost 40 minutes more because it was so large the mini loaf pans will probably only take an additional 20 minutes. Just shake the baking sheet and make sure it doesn’t jiggle and then check with a toothpick to make sure it comes out clean! I felt the same way! Thanks! Can’t wait to try this. Fall is delicious. You’ll love it! I can’t wait to make it again! 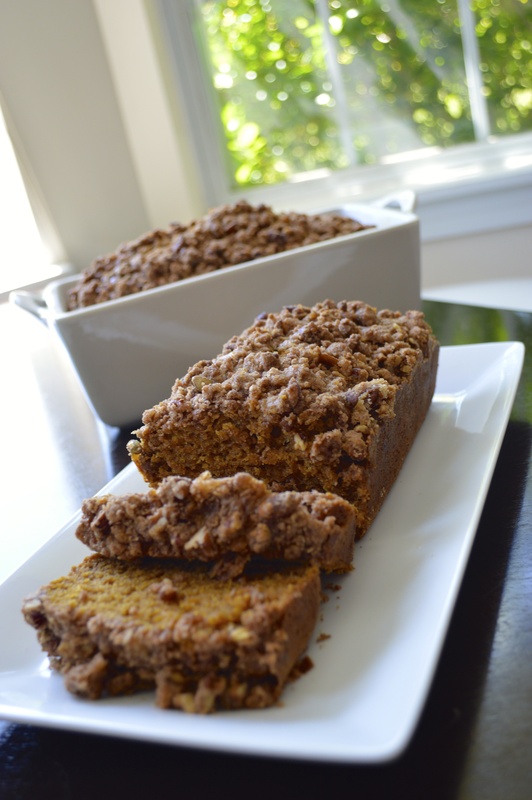 Pumpkin bread and streusel? Oh yum!!! It was sooo good I agree, the combo is to die for! What a great fall recipe, looks moist and delicious! Thank you, It truly is delicious!